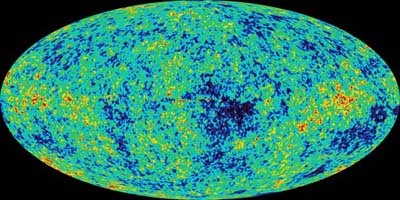 A NASA satellite has captured the sharpest-ever picture of the afterglow of the big bang. NASA today released the best "baby picture" of the Universe ever taken; the image contains such stunning detail that it may be one of the most important scientific results of recent years. Scientists used NASA's Wilkinson Microwave Anisotropy Probe (WMAP) to capture the new cosmic portrait, which reveals the afterglow of the big bang, a.k.a. the cosmic microwave background. "We've captured the infant universe in sharp focus, and from this portrait we can now describe the universe with unprecedented accuracy," said Dr. Charles L. Bennett of the Goddard Space Flight Center (GSFC) and the WMAP Principal Investigator. "The data are solid, a real gold mine," he said. One of the biggest surprises revealed in the data is the first generation of stars to shine in the universe first ignited only 200 million years after the big bang, much earlier than many scientists had expected. In addition, the new portrait precisely pegs the age of the universe at 13.7 billion years, with a remarkably small one percent margin of error. 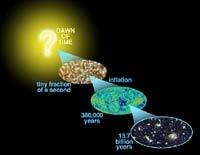 The WMAP team found that the big bang and Inflation theories continue to ring true. The contents of the universe include 4 percent atoms (ordinary matter), 23 percent of an unknown type of dark matter, and 73 percent of a mysterious dark energy. The new measurements even shed light on the nature of the dark energy, which acts as a sort of anti-gravity. "These numbers represent a milestone in how we view our universe," said Dr. Anne Kinney, NASA director for astronomy and physics. "This is a true turning point for cosmology." The light we see today, as the cosmic microwave background, has traveled over 13 billion years to reach us. Within this light are infinitesimal patterns that mark the seeds of what later grew into clusters of galaxies and the vast structure we see all around us today. Patterns in the big bang afterglow were frozen in place only 380,000 years after the big bang, a number nailed down by this latest observation. These patterns are tiny temperature differences within this extraordinarily evenly dispersed microwave light bathing the universe, which now averages a frigid 2.73 degrees above absolute zero temperature. WMAP resolves slight temperature fluctuations, which vary by only millionths of a degree. Theories about the evolution of the universe make specific predictions about the extent of these temperature patterns. Like a detective, the WMAP team compared the unique "fingerprint" of patterns imprinted on this ancient light with fingerprints predicted by various cosmic theories and found a match. WMAP will continue to observe the cosmic microwave background for an additional three years, and its data will reveal new insights into the theory of Inflation and the nature of the dark energy. "This is a beginning of a new stage in our study of the early universe," said WMAP team member Prof. David N. Spergel of Princeton University, N.J. "We can use this portrait not only to predict the properties of the nearby universe, but can also use it to understand the first moments of the big bang," he said. WMAP is named in honor of David Wilkinson of Princeton University, a world-renowned cosmologist and WMAP team member who died in September 2002.